I am very pleased to hear Professor David Harvey is going to give a series of lectures again in Nanjing University, where I studied my undergraduate and master in the 1980s. I don’t have the luck to listen now. My own research has been inspired by his works. Here are three pieces of my homework – they are not very readable and ridiculously simplistic and empirical, but just trying to make sense of Chinese “urban processes”. Land-centred urbanisation has precipitated shortage of green space in Chinese cities. However, in the Pearl River Delta, an ambitious greenway system has recently managed to flourish. It is intriguing to ask how this has become possible. Informed by the perspective of urban political ecology, this paper finds that the greenway project in the Pearl River Delta represents a set of politically realistic endeavours to alleviate urban green space shortage by adapting to, rather than challenging, powerful landed interests. Three interlocking dimensions about land—municipal land quota, rural land use claims, and real estate development—have influenced why, where and how greenways have been created. Based on these findings, we argue that research on China’s politics of urban sustainability necessarily needs to understand the country’s land politics. Urban “demolition” is perhaps a formulation of fast growing cities. 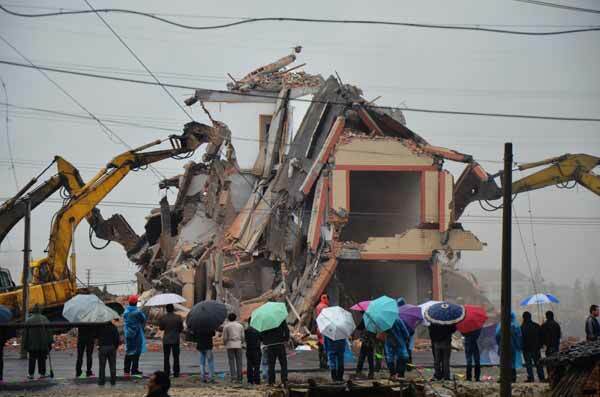 Some informal residential buildings have been demolished after the recent fire in Beijing. But instead of demolishing such housing better precaution can be taken against fire risks by making urban management more scientific and reasonable. Demolition is a temporary fix, not a viable solution. The policy of demolishing housing to control population growth in any region lacks scientific evidence. Rather than help, it actually harms the vitality of a city, exerts detrimental impact on the livelihood of low-income families, and brings inconvenience to its residents. A city is an incredibly complex and organic structure－more so if it is the capital of a country. A dynamic and prosperous metropolis requires diverse jobs and a lively urbanism. Large-scale manufacturing is resource-demanding and does not need to be located inside central areas. Social services, however, are essential for the daily operation of a capital. Indeed, nowadays global cities see the symbiosis of financial managers and catering staff. Chinese cities have been economically competitive, partly owing to the availability of affordable services. Compared with other places, urbanization was confronted with less resistance in China because it was regarded as wealth creation, from which existing land occupants received a share and migrants found jobs. As seen in other developing countries, restricting low-skilled migrant workers from informal and formal sectors has a negative implication for business. Demolition may appear to be a swift solution. But in reality, it does not solve the root cause of informal development, because there is a need for low-end services and consequently a demand for affordable housing. Instead of wholesale demolition, a more sustainable approach would be incremental urban regeneration. Informal settlements such as urban villages are developed spontaneously by the market, which indicates the constructions are economically viable and even profitable. The problem is that unregulated developments may create a substandard and unsafe living environment. More guidance and assistance from city planners are therefore needed for such construction. These places could be upgraded with the resources of their landlords to make sure the residential areas meet safety and liveable standards. In comparison with large-scale renewal through demolition, which in many cases ends up in real estate development, incremental regeneration does not require a large sum of capital. Consequently, incremental and in situ upgrade leads to affordable housing of liveable standards rather than an asset for investment. The upgrading can take place in stages by removing only buildings that are blocking major road networks or jeopardizing health and safety requirements. The improvement of the environment and basic public facilities would lead to incremental upgrading of properties by landlords. The municipal government only needs to impose city-planning standards on the refurbishment and improvement of buildings. It could provide further assistance through planning specialists, while village collectives could take responsibility for housing maintenance and management. As shown in the upgrading of urban villages in South China’s Guangdong province, which now offers a rather decent standard of rental housing, community-based redevelopment has the capacity to carry out construction without the involvement of large real estate developers. This model of incremental regeneration will change the current approach of using real estate projects to develop housing. These current projects only lead to expensive “commodity housing”, real estate speculation, local government debt and the potential financial risk of property bubbles. Large-scale demolition and renewal creates a gap in affordable rental housing, which is eventually filled up by informal development. In other words, managing a liveable low-cost housing environment in the capital will require progressive and good governance. The author is Bartlett Professor of Planning, University College London.